The Lost World Hotel is the latest addition to the Lost World of Tambun. This RM60 million theme park is an action packed, exciting adventure with the most thrilling rides and attractions in Ipoh. Now families can plan on enjoying all the facilities without having to drive off to their homes or hotels at the end of the day. The Lost World Hotel, located just a hop, skip and jump from the theme park is now open and guests can avail themselves of all the facilities with ease. Consisting of 134 rooms with a choice of king or twin beds, the Hotel also features 20 service apartments in the second block which is currently under construction. 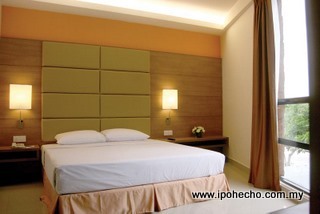 Room rates at the hotel range from RM200 to RM600 with corporate rates available. All room rates come with two complimentary breakfasts and two ‘Lost World Hotsprings and Spa by night’ tickets. The Lost World of Tambun has many ‘worlds’ packed into one and visitors, both young and old, can find activities to suit all tastes and inclinations. Five elements make up this world of adventure, the Water Park, the Amusement Park, the Tiger Valley, the Lost World Petting Zoo and the Lost World Hot Springs and Spa. The latter is the latest addition to the ever-evolving theme park. The majestic garden is a sanctuary for visitors to relax and enjoy the hot springs. The thermal water at the resort comes from a natural source and is not recycled, flowing freely through their various pools from the source and into the Kopisan River, making the water totally safe and hygienic for use. Visitors can finish off their thermal spring dips with a treatment at the Crystal Spa where they can choose from Aromatherapy, Head and Shoulder, Hot Springs Stone or the traditional Malay Urut massages. And because the hosts of activities are so myriad and engaging, having the Lost World Hotel next door can only enhance the total Lost World experience, providing a comfortable night’s sleep to start the adventure anew the following day. Valentine’s Day Dinner on Sunday, 14 Feb.
Chinese New Year a la carte Specials. From 16 Feb.
Valentine’s Day 4-Course Set Dinner. 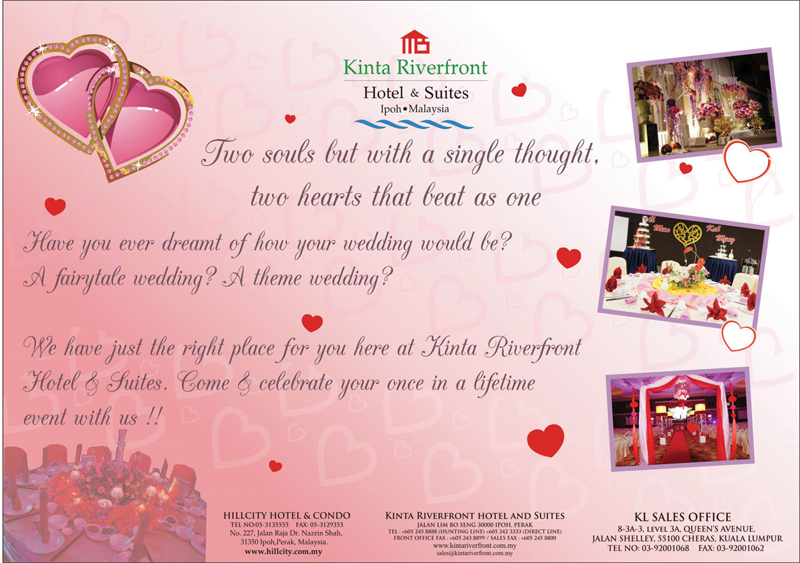 14 Feb – RM80++ per person. Call for reservations. Chinese New Year & Valentine’s Dinner Specials. Main Course: Set 1 – Grilled shrimp; Set 2 – Pan-fried Cod fish; Set 3 – BBQ Rib; Set 4 – Rack of Lamb. All sets include: appetizer, soup, sides, drinks & dessert. Chinese New Year Set Menus RM888 nett per table (complimentary 1 30ml bottle Brandy) & RM688 nett per table. CNY Yee Sang Promotion – raw fish/jelly fish/salmon/abalone – RM168 per portion & RM88 ½ portion. Valentine’s Day 5-Course Western Set Dinner (Polo Café, Level 2). 12-14 Feb, 7-10.30 p.m. – RM138 per couple with complimentary glass of sparkling juice & rose for ladies). “Fatt Choy” Hi-Tea.13-16 Feb, 12-4.30 p.m. – RM45 nett per person; RM28 nett per child below 12 years. Properity Buffet Dinner. 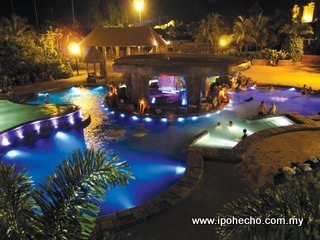 13-16 Feb, 6.30-10.30 p.m. – RM68 nett per person; RM45 nett per child below 12 years. Family Reunion 8-Course Chinese Set Dinner. 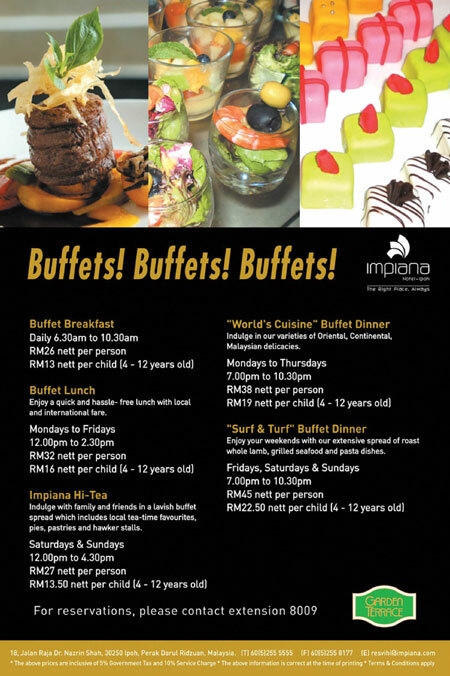 13 Feb, 6.30-10.30 p.m. Imperial Set – RM888 nett per table of 10 persons; Diamond Set – RM688 nett per table of 10 persons. Valentine’s Day 5-Course Candlelight Dinner (The Bistro). 14 Feb, 7-10.30 p.m. – RM188 nett per couple consists of: appetizer, soup, granita, main course & dessert and a complimentary glass of wine. Chinese New Year Dinner (Grand Ballroom, Level 1) Set Menus at RM688, RM788 & RM888 nett per table with complimentary 2 bottles house red wine and door gifts. Valentine’s Day 5-Course Dinner (Cinnamon Hall, Level 6). 14 Feb. 7-11 p.m. – RM170 nett per couple with complimentary pint of red wine.